Milan's prosecutor, Alberto Nobili, said Battisti confessed during questioning in prison, where he is serving a life sentence. "It is a very important recognition for the work of the magistrates, a sort of 'honour of the arms' for those who have investigated it," said Milan prosecutor Alberto Nobili. In 1979, Battisti was convicted of belonging to a far-left terrorist group outlawed in Italy - the Armed Proletarians for Communism (PAC). He escaped prison in 1981. Later, Battisti was convicted in absentia for killing two Italian law officials, for taking part in a separate murder and for planning another which left the victim's 14-year-old son in a wheelchair after a shoot-out. He lived in France, Mexico, and later Brazil where he was given asylum by the country's then-president, Luiz Inacio Lula da Silva. 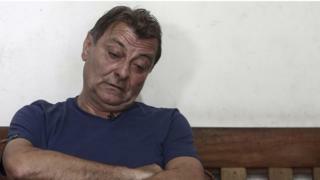 "When I killed, for me it was a just war," Battisti reportedly said during his confession. "I realise the harm I have done and I apologise to the families [of the victims]".